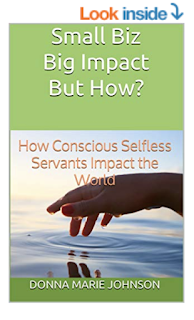 #SmallBizBIGImpact - The purpose of this booklet about conscious small business leadership is to foster greater understanding about organizational identity and servant leadership for development of an authentic, well-aligned organizational culture. BOOK: World Impact. Small Business. Free Event. Lead Like A Queen Event Series. Discover how to focus better and move your small business forward more effectively.